Love the weight and the looks of this monster! I have had too many receivers to list all of them but other than Harman Kardon (for which I just haven't been lucky enough to find a great deal on yet), I'm most satisfied with the 'es line from Sony. I think it's the cleanest sound I've heard yet from my living room. I've read about the problems in the previous posts and so I waited two weeks to see if I would encounter such problems, and nothing to write about. I've had nothing but positive experiences with the STR-V444ES. Glad to own it. I HAVE HAD THE SAME PROBLEMS WITH SONY AS EVERYBODY ELSE AND I'M AN ELECTRICAL ENGINEER. THE PROBLEM I SEE WITH SONY IS THEIR FEAR OF SOLDER. THEY USE QUITE DECENT COMPONENTS BUT DON'T PUT THEM TOGETHER VERY WELL AND DUE TO THE HEAT THE OFTEN GET COLD SOLDER JOINTS AND NEXT THING YOU KNOW IT'S A TRIP TO THE REPAIR SHOP. I GOT THIS RECEIVER FOR NOTHING FROM A FRIEND SO I WAS NOT EXPECTING MUCH. HOOKED IT UP AND IMMEDIATELY NOTICED IT WAS QUITE HOT ON TOP SO THE FIRST THING I DID WAS PULL THE COVER OFF AND PUT A 12 VOLT COOLING FAN ON TOP OF THE HEAT SINKS. AND I HAVE NO RESPECT FOR EQUIPMENT THAT CAN'T HANDLE MY CONSTANT SWITCHING SPEAKER SETUPS ETC... I HAVE ABUSED THIS THING MUCH MORE THAN ANY NORMAL OWNER WOULD RUNNING 2 OHM LOADS AND RUNNING IT AT LEVELS THAT MAKE YOUR EARS BLEED AND IT HAD ONLY WENT INTO PROTECT MODE ONCE SINCE I PUT THE FAN IN. IF YOU PUT YOUR HAND ON TOP OF IT NOW IT'S ONLY SLIGHTLY WARM. IT DOES NEED A REGULAR BLOWING OF THE DUST DUE TO THE INCREASED CIRCULATION AND YOU CAN HEAR THE FAN AT VERY LOW VOLUMES BUT WTF.... OTHER THAN THAT I THINK ITS KIND OF IRRITATING TO ADJUST EQ SETTINGS I HAVE A NICE EQ THAT CANNOT BE PLUGGED INTO IT DUE TO SONY'S FEAR OF COPYRIGHT INFRINGEMENT SO OF CAME THE COVER AGAIN AND I TAPPED INTO THE PREAMP B4 IT GOES INTO THE SURROUND PROCESSOR AND PUT IN A COUPLE OF RCA JACKS AND WALLA I DON'T HAVE TO MESS AROUND WITH ALL THE BS JUST TO MAKE A QUICK ADJUSTMENT TO MY LIKING. IT DID NOT COME WITH A REMOTE SO THAT IS A HANDICAP AND THE WANT AN ARM AND A LEG FOR ONE EVEN USED ON E-BAY BUT I HAVE NOT BEEN ABLE TO KILL IT YET SO TO ALL YOU WHO ARE HAVING PROTECT ISSUES GO BUY A 9 DOLLAR COMPUTER FAN DVM THE POWER SUPPLY BOARD AND COOL IT HOW IT SHOULD HAVE BEEN IN THE FIRST PLACE AND YOU SHOULD HAVE TROUBLE FREE SOUND AND FROM SONY WHO WOULD HAVE THUNK? very difficult to configure Component Video. does not con exist with S-video and component. Pre dates HDMI...cannot store EQ settings for any mode! ease of use - you don't need "a degree in Sony"
Now, I am "stuck" with it- in a good way. I can't replace it with new gear for under $1000 and maybe not even then. The unit has A and B speakers in addition to 5.1 and I drag speakers around on occasion so this feature rocks. It has pre-outs which I use to connect to a tube-amp for hi-fi and the only hissing I have experienced is when I tried to go via pre-outs to the tube amp and I found that using heavily shielded cables --a pair of Monster MKII cables-- and connecting the v444es front pre-outs to an adcom GFP 555 pre-amp works wonders. The adcom unit somehow cleans up the hiss coming off the pre-outs before the adcom goes out to tube amp. So when listening to speakers directly connected to the v444es, no noise. no hiss. no hums. I have v444es hooked up to Klipsch RVX54's and a Klipsch RS10d sub-woofer, and rvx42's surrounds. I have enough sound to wake up the dead and re-arrange the pictures. The other thing I really enjoy are the EQ banks that allow detailed configuration of bass, mids, and trebels. You can select "wide" "mid" and "narrow" play with decibel settings and also frequency settings to really get a precise effect. You can also run the EQ in "auto detection mode" or bypass EQ all together or select 2 channel stereo (with or without EQ). Besides the RVX's I have a pair of Heresy III's that are 3-way suspended speakers that sound really, really, good through the v444es but slightly better coming off the tube-amp. Now, the Cornwall I's that "came with" the v444es are now sonically restored and when connected to the v444es, sound amazing. I listen to a lot of acoustical stuff and the Cornwalls work really well with the v444es for reproducing a great sound-stage, imaging, and just great sound. My only qualm is that the v444es does not remember the EQ Bank settings for any given input, the way, say, a recent Panasonic receiver I owned was able to do. I replaced a Panasonic SXR57K digital receiver with HDMI with this one because of the quality of the sound I got out of the v444es. I have a combination of things connected to the v444es including my PC, a Pioneer laserdisk player, a new Onkyo CD player, my iPod classic, and a DVD player. The v444es features a phono input but my turntable sounds better connected to the adcom pre-amp which has a better phono input in my opinion. My panasonic dual VHS/DVD recorder connects via optical to v444es and via component video for video signal but I also have the HDMI ouput going straight to a Westinghouse TV monitor. No problems with synching. My v444es came with a skinny remote but not the programmable one. However, I found a source on eBay, wrote about the v444es and was suggested a sony programmable remote that would work, and $40 bucks and 2 days later, I had a new working prorgrammable remote for a 1999 receiver that even drives 2008 CD player and a 2007 DVD player....The unit overall is of very solid construction , is fairly heavy, has a thick power cord, all gold-plated outputs and inputs, 2 optical inputs and 2 coax inputs and was a really great "accidental" find for my needs. I got lucky. 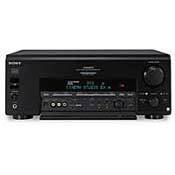 I would say that if anything happened to it I would have to be in the market for a 1500 - 2000 receiver to find an equivalent sounding and feature-laden receiver to handle both A/V and hi-fi capability. None that I can see. It just doesn't work. Simply put. . . .. this unit, like most of Sony's products of the past few years, is a lemon. I have long since sworn off buying ANYTHING Sony. Cameras that work for a year and then start acting up. Video equipment that just doesn't live up to it's claim but the bottom line is it all seems to break long before it should. At first I thought it was me. I was listening to my audio system to loud and the protectors would kick in and turn the unit off. I started listening at lower and lower volumes and the same thing kept happening. The system is my living room which I don't use all that much so I found myself just going to other rooms in the house for music. But then the same problem kept happening on DVDs. Like many of the other Sony products I had bought over the years this to is fairly worthless. Of course when taking it to be repaired the problem couldn't be duplicated. Hook it back up and smae thing happens. Have a tech come out to the house and look over the system. Checks all connections (the system was professionally installed) and he says it all works but then the unit shuts down while testing. He recommends cooling the unit with better vents and a fan and leaves. I take the recommendations and the unit still does it with the back off the rack and a fan. So I search the Internet and find that many people have the same problem. Take the unit in for repair and all checks out. Put it back in the rack at home and you can't turn it on past a very soft listening level. Limitless power, dead silence behind the source, never hot, unhreakable, alive, and even the faux 6.1 works! Also very handsome. Not one, unless you are weak of back. Have someone else maneuver it into place for you. First of all I stole this thing on eBay for $250 and will be in therapy with guilt issues ever after. Now then - this thievery was intended as a turnaround. I was gonna relist the thing for about twice what I paid for it. It is, after all, the same identical machine as the V555 (but with a different and - IMHO, far more useful remote - there are NO other differences), and both are 1st cousins to the legendary DA777ES. The similarities are eerie, really. The "V" series (probably doomed by Sony's idiotic decision to use the Euro designation that year, never before and never again)was successor to the prototype DA777ESs throne once that one was laid to rest after a short but incredible run. Now it is the holy grail of receivers, but the "V" series from Sony, especially the 444/555,comes so close to duplicating the mother ship that I feel as though I have bought a baby on the black market! In short it is incredible and it is going to live in my house forever, amen. It replaced a perfectly good DA50ES which is rated at the same power and has many - but far from all - of the features of the "V" series. The DA50ES also sounds wonderful. No argument from me there. But the V444 sounds just that much better - more depth,dimensionality, clarity, neutrality, deep sound stage, accuracy - I could go on but suffice it to say I was stunned during its "road test" and it was so damned handsome that my wife was immediately taken with it as well, the first time she's evere shown any interest in my all-consuming passion. So the DA50 too a hike. It's up now, and will bring more than I paid for the ill-gotten V444,I am certain. It is a very nice machine, but it has been edged out by a super-fine one, and one that doesn't have the redundant second phono stage of the DA777, nor the admittedly slightly easier to use but far more weighty and complex motorized control panel of the DA777 (just more to go wrong someday) - just a very sleek and elegant door which opens quietly, smoothly, and, well, elegantly, at the touch of a button, to expose all the less-often-used controls beneath it. Before I get to performance, I want to say this. Hiss? What hiss? Where? And what's this about the thing running hot? Are you keeping yours inside a little coffin or something? This thing is never more than pleasantly warm to the touch, even when it has been left on all night at the 11:00 o'clock setting. And no transformer hum. None. This thing is absolutely dead quiet. (And, I should add, everything else about this particular one is perfect. Cosmetically "as new", original carton and packing, all manuals in both English and French, both remotes, both antennas, everything as though it had come off the shelf of a good store. I do feel bad about the price). So none of the usual complaints, and, so far, not one instance of anything weird happening at all. Not even a "Protection" event. Nada. In fact, the only thing about it I find the least bit odd is that 11:00 o'clock setting, which I wasn't prepared for after using the DA50ES for so long. It would make with room-filling sound at the 9:00 position, but the "V" series, like the 777, has a different sort of volume control shaft which apparently results in a logarithmic increase in volume as it is turned, so that there are no nasty surprises (no heart attacks on Sunday morning when a disc is inserted and "Play" is pushed, no "SWEET LORD TURN IT DOWN PLEASE GOD QUICK!" There's plenty of wiggle room. OK then, performance. I guess I've covered most of the basics. It does nothing wrong, everything right. Stereo sound is unnervingly accurate and "involved." Out of silence comes incredibly sweet, detailed, uncolored sound. Not even the "warmth" of the DA50 which I had kinda liked. Nothing but the truth. Insert an SACD like "Lady In Satin", the '58 Billy Holiday chestnut, and lo and behold! It is new again! Like I never heard it before! Or Nick Drake's "A Treasury" collection - again, as if never heard before; and even that piece of crap they made without Alan Parsons being involved, the 30th anniversary ed. of DSOTM, and only if played in 5.1 mode, sounds almost good. Of course the original Harvest release still sounds better, and that, again, is new to me, I now having heard things, especially at the beginning, that I swear I have never heard before (and of course there is plenty to hear - maybe I'm hallucinating, but it's good). Throw on Steely Dan's SACD of "Gaucho" or Alan Parsons' DVD-A of "On Air", a beautiful piece of work in one dimension, becomes all that and so much more. Try something insane, like Michael Murray's pipe organ via the turntable (Technics J92 linear tracking arm) or the Telarc "Pictures at an Exhibition." And DVD video? It is a religious experience! From the obvious like the re-release of "Alladin" (my favorite torture test scene is "Alladin in the Cave of Wonders"), or quite recently "The Aviator." Even talkies like "Being Julia" become a pleasure. The V444ES is a classic! DA30ES, DA50ES, AudioSource Tuner/Preamp 2,Rotel RB980BX,Yamaha M-40 and C-60; Currently Sony DVP-NC685V, Sony VCR, B&W DM600 S3s up front, B&W CC3 Center, Boston PV600 powered sub, Cambridge Newton 100's on Sanus Euro stands in back, and Kenwood RFU-6100 "thing" that powers the rears. I don't know what to call it, but it works great. Easy to use,good power,nice remote,great value. I have owned this unit for over a year now.I moved it to my living room system(upgraded to Rotel separates in my main HT)to replace my Yamaha DSPA-3090 which was great but has no DTS(moved to bedroom system)This receiver is an excellent performer,no hiss problems,great set up flexiblity,fair amount of power.I am running NHT ST-4,SC-1,Mission 731i pro's,Yamaha 10' 150watt sub,Sony KV27XBR55,DVPNC600.This system sound excellent,strong on music and home theater.No Prologic II,but the Sony DSP Cinema modes sound very good on 2 channel sources like satelite,or vhs. I just wanted to comment on the reported "hiss" others have mentioned. My unit also =had= this problem - though Sony didnt say it was a "known problem". I took my unit in for service, provided them with a detailed outline of the issue, and my setup. They returned the unit to me stating they were unable to replicate the problem. I took it back, directly to the service center.. had the tech hook the unit up, and showed him first hand. His initial responce was that it is normal, but I pushed the issue - the hiss really is unacceptable. The tech then went to talk with an ES sales rep, who told him there might be "some" hiss from the rears only, but it shouldnt be noticeable. The hiss on my unit came from all speakers, including the rears. At that point, I left my unit with them. They ran numerous tests, compared my unit with a couple others in the same series, V333ES, V444ES, and the V555ES. They did find a problem with the capacitors - the hiss was 1db above spec in the fronts. After a couple of weeks, I picked up the unit - Sony had spent a =huge= amount of time on it, I saw the work log myself. To my suprise, once I got everything hooked up again, the annoying hiss was gone ..and in fact, overall, the unit has much better clarity. At any rate, for those with this problem, dont just live with it - it can be fixed. Build quality! This is my third ES receiver; my last one ran 8-12 hours a day for eight years. If it had digital inputs for DD and DTS, I''d still be using it. My other one I gave to my stepson when I upgraded to DTS. As long as you use a better remote--Sony 2100 or Pronto for example--this is a fine unit. One of the biggest complaints about this unit is the inability to assign the digital inputs. Here is my work-around: You can''t assign the inputs, but you can re-name them. For example, I don''t need the "TV-Sat" digital input, so I am renaming it as "CD"; the actual CD input I am re-naming "DMX" so I can use the coax digital input from my Digital Music Express receiver. Then, using a learning remote such as the Sony 2100, I am teaching the remote to respond accordingly, feeding the new links into the old buttons. So now, when I touch "CD" on my remote, it activates the "TV/Sat" input which is labeled "CD" on the front panel readout of the 444ES. Works for me.